Do you ever wonder why sugary, processed candies usually try to imitate natural fruit flavors? Why would we eat a fake tasting strawberry or grape candy, when we can easily get these delicious fruit flavors in their most natural form by simply visiting the produce section of our local grocery stores? Don’t get me wrong - I enjoy the occasional sweet treat just as much as the next person, but I just think that the real fruit is better for us. After all, fruit is nature’s candy. Dragon fruit, also called pitaya, is a beautiful tropical fruit. I can’t imagine a dragon fruit candy even comparing to a fresh bowl of pitaya. But when I randomly heard this news about Hi-Chew, it sparked my interest to do some research on dragon fruit (in its natural form) and the potential health benefits. Believed to be indigenous to Central and South America, dragon fruit is actually a member of the cactus family. There are red, white (the one most commonly sold in the U.S. and also called “strawberry pear”) and yellow flesh varieties of pitaya. “Both red and white varieties of dragon fruit have been shown to reduce insulin resistance and fatty liver in obese mice,” according to one report. Dragon fruit is said to have the consistency of a kiwi and taste like a cross between a kiwi and a pear. The little black seeds in the flesh of the fruit are also edible and nutritious, containing monounsaturated fats (healthy fats also found in avocado, nuts and olive oil) and omega-3 fatty acids. The seeds also contain fiber and may help provide relief from constipation. “Dragon fruit is a good source of several natural antioxidants like betalains, polyphenols and ascorbic acid [vitamin C], reports the National Institutes of Health (NIH). Antioxidants help prevent and delay cell damage by combating inflammation and oxidative stress (OS), two major contributors to several types of disease. Antioxidants may be found in supplement forms but eating natural foods that contain them may be a better way to help protect yourself from cancer, cardiovascular disease, dementia, arthritis and more. Betalains. This antioxidant is more abundant in the red flesh pitaya. It is also found in beets. If you see a beautiful, red natural plant food, it is likely getting its color from betalains. “Betalains from cacti fruits [like pitaya] and red beet exhibited strong antioxidant activities in biological environment by inhibiting lipid peroxidation [which causes cell damage] and heme decomposition at very low concentrations. Betalains also counteract lipo peroxidases which may damage gastrointestinal cells during food digestion,” according to this report from Researchgate. Polyphenols. Green and black tea, coffee, chocolate and red wine are examples of delicious foods and drinks that also contain polyphenols. Polyphenols have numerous benefits. They may lower the risk of developing type 2 diabetes, protect against heart disease, help with maintaining a healthy weight and even influence gut bacteria. Ascorbic acid. More commonly called vitamin C. You likely already know that vitamin C is a powerhouse antioxidant that may help fight the common cold and flu. In addition to this, vitamin C may help with complications from diabetes, slow down the aging process and accelerate wound healing after surgery. And what’s cool about dragon fruit is that it contains more vitamin C than oranges! “Aside from vitamin C, dragon fruit contains carotene, which is linked to several anti-carcinogenic qualities, including reducing a number of tumors. Moreover, lycopene, responsible for the red color in dragon fruit, has been associated with lower prostate cancer risk,” according to this report. One study from the NIH revealed that diabetic rats who were given dragon fruit extract experienced a reduction in arterial stiffness and oxidative stress. Because of its high fiber content, pitaya may also stabilize blood sugar levels. In moderation, dragon fruit appears to be a good food if you are diabetic or prediabetic (but as always, discuss your diet with a competent healthcare professional). A half a cup of fresh dragon fruit will only cost you about 52 calories and contains less than a half a gram of fat. On top of that, dragon fruit has a high water content. All of these factors make this fruit waist-friendly and may help keep you feeling full, less bloated and hydrated. The combo of water and antioxidants is also a recipe for beautiful hair and skin! What are some other powerful nutrients in dragon fruit? Dragon fruit contains vitamin B12, a vitamin mostly found in animal foods that serves many purposes in the body, including helping make DNA and red blood cells (that carry oxygen to your organs and give you energy and help prevent fatigue). 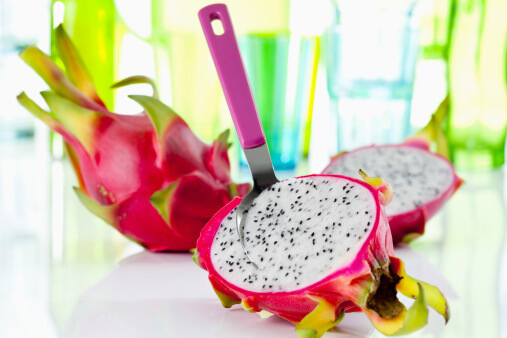 Phosphorus is a must-have mineral found in dragon fruit (23 mg in a half a cup). This mineral often does not get the credit it deserves, but it does so much for your body. Phosphorus is almost as abundant in your body as calcium and helps calcium build strong bones and teeth. Phosphorus plays a role in how your body stores and uses energy, repairs cells and is needed to make proteins like the one responsible for the oxygen-carrying capabilities of our red blood cells. This mineral has also been linked to weight management. In a study of almost 40,000 women in Korea, phosphorus deficiency correlated with weight gain from oral contraceptives. Furthermore, a study from Lebanon showed that phosphorus supplements in a small group (63 people) for 12 weeks significantly decreased body weight, BMI, waist circumference and subjective appetite scores. What really makes dragon fruit so attractive is its high value of antioxidants and fatty acids. And yes, I would argue it’s tastier than any candy! Ways to eat dragon fruit? Dragon fruit is delicious simply eaten raw or blended into a smoothie. Remember, the seeds are edible and also very good for you! You can even top pitaya over Greek yogurt or healthy, homemade pancakes. At the next party you host, consider serving this dragon fruit and avocado salsa. By serving this at a party, you may introduce dragon fruit to someone who likely would have never considered trying this fruit. We can educate each other and encourage others to try healthy foods. Any downsides to eating dragon fruit? Overall, dragon fruit appears to be safe (even for pregnant and breastfeeding women). But I always recommend caution with any foods especially for people with existing medical conditions and those of you who are taking both prescription and over the counter medications. You always want to avoid a drug interaction. In some rare cases, people have developed an allergic reaction to dragon fruit. “In two cases, women with no history of food allergies developed anaphylactic reactions after consuming a fruit mixture that contained dragon fruit,” according to this report. If allergies are of concern to you, consider taking a comprehensive GI Effects test.